How many times have we looked at improvements in performance and wondered, “Why didn’t I think of that?” The word we hear is that sharp street engine tuners are employing five-gas exhaust analyzers as useful tools for improving performance simply by studying the by-products of combustion. If we think of a gas analyzer as nothing more than another tool like a timing light, compression tester, or vacuum gauge then we can use this tool to help an engine run not just cleaner but with more power and potentially better fuel mileage. Lowering some exhaust gases while increasing others can promote much more efficient combustion. This first in a two-part series will help you determine which exhaust gases to enhance and which ones to lower to accurately tune the engine. The five exhaust gases typically measured are hydrocarbons (HC), carbon dioxide (CO2), carbon monoxide (CO), oxygen (O2), and a collection of oxides of nitrogen commonly referred to as NOx. Each of these gases offers insight into the efficiency of the combustion process, offering the tuner a way to evaluate combustion efficiency. We will take a closer look at each of these exhaust components separately for this story and then return with Part Two to offer insights into how these gases can be used to help the tuner improve engine performance. We hooked our old Sun analyzer to our 350ci small-block ’65 El Camino just to see how the Edelbrock fuel-injection system was performing at idle. With most aftermarket EFI systems, you can adjust the idle air/fuel ratio very quickly, so we dialed it in using the exhaust analyzer to produce the ideal ratio in regard to efficiency. Before we get into the tuning aspect, let’s run through all the major players in the combustion process. While gasoline is our fuel source, it will not burn without an oxidizer – oxygen. This gas is present in our atmosphere, but it only accounts for roughly 21-percent of the total. The largest atmospheric component is nitrogen, with more than 78-percent. The remaining one-percent is made up of trace gases such as argon, helium and even a tiny amount of nitrous oxide. The atmosphere contributes all these gases to the combustion process and as you’ll see, they combine in various fashions that are both conducive to performance, but can also be detrimental depending upon the engine’s state of tune. In the perfect combustion process, hydrocarbons in gasoline combine with oxygen to form H2O – water – while CO2 and nitrogen (N2) would pass through the combustion process unaffected. Unfortunately, perfect combustion rarely occurs in the internal combustion engine. However, water is still a significant result and it can be witnessed as that plume of steam from the tailpipe on winter days. We discovered that feedback from even our antique Sun four-gas machine offered information that we could use to produce a much cleaner idle quality just by making very slight changes to idle mixture, idle speed, and initial timing. Without this feedback achieving the better numbers would have been a hit-or-miss proposition. In the real world of engine performance, the combustion process discussion begins with what is called the chemically correct air/fuel ratio for a given fuel. This is most often referred to as the stoichiometric air/fuel ratio. In the case of straight gasoline, that air/fuel ratio is 14.72:1. This stoichiometric ratio is where—theoretically—all of the fuel has been combusted. You may also see this ratio expressed as an excess-air (lean) air/fuel ratio. You can think of a gas analyzer as a way to evaluate the results of this combustion. Visually tracking combustion inside the engine is challenging, so let’s use an analogy suggested by our main cheerleader in this gas analyzer process, Norm Brandes at Westech Automotive in Silver Lake, Wisconsin. If you’ve ever operated or watched someone use an oxygen-acetylene torch, you are witnessing combustion. When the torch is first fired and running only on acetylene gas – the mixture is a very rich air/fuel ratio and the result is a sooty, black smoke that makes very little heat. Then add oxygen to this process to adjust the air/fuel mixture closer to ideal and the flame becomes significantly brighter with greater temperature. If you’ve ever operated a cutting torch, then you know that adding additional oxygen makes the flame much brighter and hot enough to melt steel. These are just two examples of different air/fuel ratios and how they affect the efficiency of the combustion process. 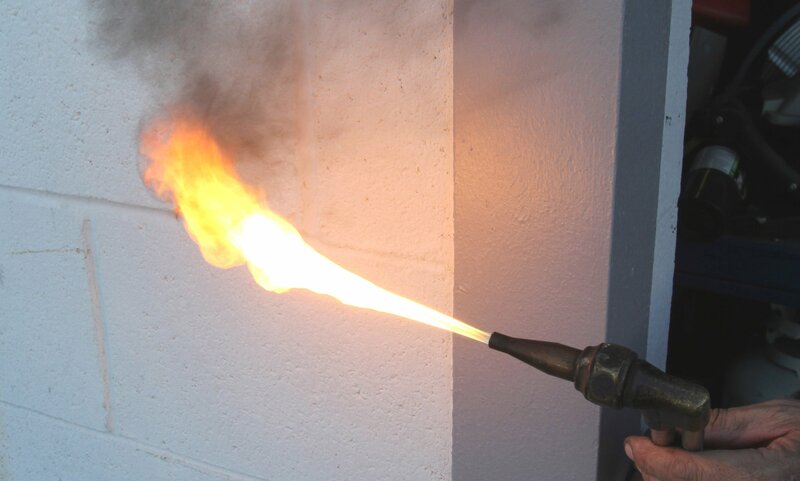 An oxygen-acetylene torch started with a very rich acetylene mixture burns very inefficiently as exhibited by its black sooty exhaust plume. That same oxygen-acetylene torch set to its proper air/fuel ratio burns very brightly and efficiently – much like an efficient air/fuel mixture inside an engine’s combustion chamber. Which Gases Are We Talking About? Let’s start our gas exploration with hydrocarbons (HC). Gasoline is made up of a long chemical string of hydrogen and carbon atoms that is part of a larger family of hydrocarbons that include gases like methane, propane, and butane. When gasoline is combusted, it is rare for all of the HC molecules to be fully combusted. Within the combustion chamber, HC gases near the cylinder wall are cooler and often are not included in the combustion process. As a result of combustion, carbon deposits form on the combustion chamber and on the piston top. These deposits are porous and during a normal combustion process, hydrocarbons are forced into these porous deposits where they do not take part in the combustion process. These residual HC components then often escape with the exhaust gas, contributing to high HC levels. Our old Sun machine uses a simple old school black and white display screen that delivers results on HC, CO, CO2, O2 and engine RPM. When this photo was taken, the O2 sensor had just died. We’ve since replaced it and we’re back to four gas results. When the exhaust valve opens, these residual or non-combusted HC gases escape. The volume or total amount of HC molecules present in the exhaust gas is then measured by the exhaust gas analyzer. Common sense dictates that the higher the HC count in the exhaust (as measured in parts-per-million or ppm) the lower the efficiency of the combustion process. There are dozens of reasons why the HC count may be high. Some are due to simple tuning issues like an excessively rich air-fuel ratio while other reasons often are related to the actual engine architecture such as the shape of the combustion chamber. Combustion chambers used in engines from the ‘50s are not nearly as efficient as those designed in the 21st century. Our second exhaust gas component is carbon dioxide (CO2). As mentioned earlier, this gas is formed during complete combustion and while rarely discussed, CO2 can be thought of as the leading indicator of complete combustion. Simply put, the higher the percentages of CO2 measured with an exhaust gas analyzer, the better the tune. Next in line is carbon monoxide (CO). As you probably already know, CO is an odorless and colorless gas that is highly toxic. CO is also the result of incomplete combustion with a fuel-rich mixture with insufficient oxygen to complete the process of contributing two oxygen atoms with a carbon atom to form CO2. A higher percentage of CO indicates the level of incomplete combustion which relates to the air/fuel ratio. This isn’t necessarily bad since best power is almost always the result of a richer air/fuel ratio designed to have all the oxygen present in the chamber contribute to combustion. CO then becomes an accurate indicator of air/fuel ratio. We’ve included a chart above listing the relationship of percentage of CO in the exhaust to air/fuel ratio. To keep the chart size reasonable, we’ve only included the even numbered air/fuel ratios. From this chart, you can see how CO increases with a richer air/fuel ratio compared to stoichiometric. Next up on our list is oxygen. In perfect combustion, there will be no free oxygen content in the exhaust as it will have mixed with hydrogen to form water. Since this rarely occurs, a lean air/fuel ratio at idle, for example, will result in the free oxygen content generally in the under-2-percent range while a very rich air/fuel ratio will reduce that percentage. This percentage can also be used to calculate air/fuel ratio. Oxides of nitrogen (NOx) is the fifth exhaust gas component and one of the nastier results of combustion. This gas is created by the heat of combustion and causes the nitrogen atoms to combine with free oxygen. Essentially, with higher cylinder temperatures formed through leaner air/fuel ratios, more NOx will be created as expressed in parts-per-million (ppm). NOx is the gas that creates photochemical smog which is that yellowish haze commonly seen in urban areas such as Los Angeles or Denver. The greatest amount of NOx is produced when the engine is under heavy load such as wide-open-throttle (WOT), but oxides of nitrogen can also be produced in smaller quantities under light, part-throttle load with lean air/fuel ratios. A wideband oxygen sensor like this one from Innovate Motorsports is better feedback than no tuning feedback. However, evaluating the results from a four or five gas analyzer offers much more information about what’s happening inside your engine’s combustion chambers. Now that we’ve examined each of these gases individually, they begin to paint a picture of what happens during the internal combustion process. We can use these results to evaluate how efficiently an engine runs and how it could be tuned or modified to improve the combustion results. More importantly, all five of these gases need to be evaluated as a package since focusing on only one particular gas can lead to incorrect assessments of what is really happening. An example of this concept can be applied to tuning by relying on a wideband oxygen sensor (WBOS). These sensors operate not by measuring the actual ratio of gasoline to air, but instead measuring the free oxygen content in the exhaust and then calculating an air/fuel ratio based on that single gas. A machine that can measure all five exhaust gases will offer a much broader view of the entire combustion process that cannot be gleaned from air/fuel ratio alone. This is the EMS Model 5003 portable tester. This machine is aimed at the professional shop and is priced accordingly, but it does offer great information on engine performance. A less-expensive Model 8000 uses a laptop to display the results. These machines also offer much quicker response time than older machines, making the entire tuning process much more efficient. As any skeptical car guy has already surmised by now, five-gas exhaust analyzers are neither plentiful nor inexpensive. But for the more progressive tuners, just the knowledge of what machines like these can offer should be enticing enough for the more motivated tuners to find a resource for both part-throttle and WOT tuning efforts. As an example, several years ago this author purchased a discontinued Sun Instruments four-gas exhaust gas tester for around $400. These machines had been used for California emissions testing until demands for five-gas machines made it obsolete. We purchased this machine in hopes of improving idle quality through more complete feedback. At the time, we were only focused on reducing the HC and CO levels while ignoring the CO2 or O2 levels. Recently our interest in sniffing the exhaust plume has been rekindled and we’re now learning that evaluating all of the gases is the best way to tune. This is a display screen on our laptop from the EMS Model 5003 machine indicating all five gases. The machine runs on 12 volts so we can drive the car with the machine located in the trunk while powered from the car’s electrical system. With an aftermarket EFI car, we can make changes to the fuel or spark maps and instantly view results of the changes. In addition, we’ve been in contact with Jon Palek at Emission Systems, Inc. learning about his new portable five-gas analyzer that is far superior in several ways. Not only will the EMS machine read all five gases but its small size, portability, and 12-volt power source makes it easy to use on the road. This offers far more flexibility for tuners. EMS Gas offers several different analyzers that offer the use of a wireless connection to a laptop to display the software output from the machine. Armed with this new knowledge, we dusted off our old Sun machine and used it to evaluate a mild 9.0:1-compression, 383ci small-block Chevy with an Edelbrock Thunder series carburetor. Our machine does not measure NOx, and for this first set of tests our O2 sensor also failed, so we used just the three results of CO, CO2 and HC because the HC data was downright horrible. As you can see from the Sniff Test chart, the engine now runs much cleaner, smoother and is much happier idling in gear now than before. This series of tests were performed on a carbureted 383ci small-block Chevy in a ’64 El Camino. Test 1 revealed the way the car had been driven for several months. Clearly it was suffering from horrible HC output. As we discovered, this was the result of lean misfire even with the CO at 2.4-percent, which equated to a 13.6:1 air/fuel ratio. In Test 2 we richened the idle mixture screws slightly which raised the CO to 3.3-percent (richer) which is equivalent to a 13.27:1 air-fuel ratio. We also increased the idle speed slightly so the CO2 numbers remained very good at 16-percent while dramatically lowering the HC to 780 ppm – which was more than 50 percent. For Test 3, we added 2 degrees of timing for an initial of 18 degrees and leaned the idle mixture screws further. This reduced the HC count but the CO2 dropped by over half. This indicated we went too far with timing since CO2 is an excellent indicator of combustion efficiency. Looking at all three tests, it became clear that Test 2 was the most efficient of the three. None of this would have been possible without the feedback from the analyzer. A five-gas version would have been even better. In Part Two of this article series, we’ll dive much more deeply into tuning with some of the test results recorded by the EMS machine. The company also offers several interesting charts that list the deal combination of gases for idle, part-throttle and peak torque. But we’ll save those for Part Two.